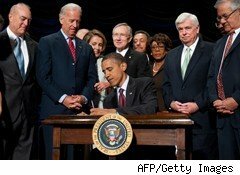 After more than a year of wrangling by Congress to craft legislation, President Obama signed the Wall Street and Consumer Protection Act into law Wednesday at a ceremony in Washington. The new regulations are viewed by many analysts as the most sweeping reforms to hit the financial industry in more than half a century. This is "reform that will prevent the kind of shadowy deals that led to this crisis, reform that would never again put taxpayers on the hook for Wall Street's mistakes," the president said last week. The legislation, approved Thursday by the Senate on a 60 to 39 vote, provides stronger oversight of complex financial products and seeks to prevent future bank bailouts of the kind that resulted from the 2008 financial crisis. The bill's passage was largely along party lines. Only three Republicans, all from New England, backed the bill. Republican leaders don't like some of the bill's major provisions, such as creating new rules for derivatives, CNN reported. They also object to the bill's failure to address the increasingly insolvent government-owned mortgage giants Freddie Mac and Fannie Mae, beyond calling for a study. Republicans also balk at a provision Obama keenly backed: the creation of a consumer agency to end the financial industry's predatory-lending practices. In prepared remarks, the president said the provision will provide the strongest consumer financial protections in history. "And these protections will be enforced by a new consumer watchdog with just one job: looking out for people -- not big banks, not lenders, not investment houses -- in the financial system," Obama said. Still unknown is who will head the new agency, known as Consumer Financial Protection Bureau. Those considered top candidates include Elizabeth Warren, who heads the congressional panel charged with overseeing the Troubled Asset Relief Program. In that role Warren has been harshly critical of the Treasury Department, headed by Timothy Geithner. The Treasury secretary is thought to oppose Warren for the job. Others being considered for the post include Michael S. Barr, an assistant Treasury secretary, and Eugene Kimmelman, deputy assistant attorney general in the Department of Justice, NPR reported. While Republicans have criticized parts of the bill for being too far-reaching, others have complained the Democrats' deal-making resulted in watered-down legislation. The bill, for example, doesn't hold car dealers to the same standard as other suppliers of consumer credit. Though now law, many of the of the law's provisions won't take effect for at least a year as regulators scramble to write new rules and implement them, AP reported. "That will take some time," said Deputy Treasury Secretary Neal Wolin. "But it is worth it." But one aspect of the bill does take effect immediately and it's already causing fallout. The new law makes credit-rating agencies liable for the accuracy of their ratings. That has the nation's top ratings firms in the odd position of asking their clients not to use them,The Wall Street Journal reported. Until the rating agencies get a better handle of their legal liability, they are refusing to let bond issuers use their ratings.